Obese German Shepherd... This is a topic that has been discussed too frequently among the GSD enthusiasts all around the Internet. The problems of overweight is too common and unfortunately obesity has hit a few breeds more than the others, and German Shepherd is one of them. Problem of obesity in a medium sized breed like GSD is often not identified and understood by the owners. The irony is that when a owner - if a newbie or if not much experienced, sees his dog he would often claim that his dog is too thin, and needs to gain weight. Sadly, the consequence is overfeeding that often leads to deformed structure, impaired digestive system, abnormal liver function, weight gain etc. 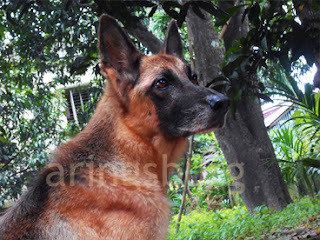 You can click through this link - offering information about Food and Nutrition for German Shepherds... most important to know for an owner is science of Food and Nutrition For German Shepherd. Unfortunately not much has been discussed about why a German Shepherd may grow skinny - or rather too skinny and doesn't recover or recover very slowly. I want to share some very unique experience - an incidence that had brought wrinkles in my forehead! January 18, 2015, 5:46 AM - My Rex, my boy, my friend who taught me how to love a dog and how to be loved by a dog, left his last breath, breaking our hearts into pieces. 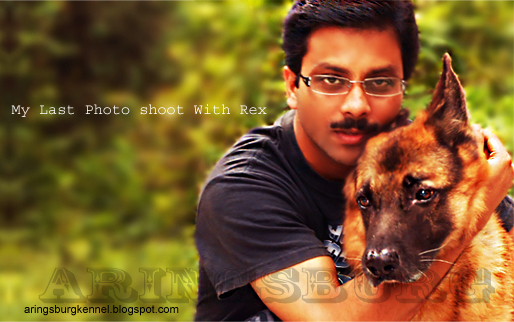 The very next day of Rex's unfortunate demise, Rechie (Rex's Daughter) my darling girl stopped all her play. She ceased to eat, bark and move. What worried me most was that Rechie even stopped sleeping. She used to keep her eyes opened all through night. In just as fewer as only 10 days she seemed to have forgotten all her normal behavior, and she carried herself in a way as if we were all new to her. Her blank look confused all of us, including the couple of best vets whom I visited. The main medical concern was that her body mass index (BMI) had rapidly fallen to an alarming level. I am sure I am not the only dog owner to face this challenge. I talked to several vets and none of them have effectively diagnosed the problem. I admit that that it was beyond my imagination that a sudden emotional and psychological trauma could have such a deep impact on her health. I started analyzing the overall situations and series of incidences that had happened. Finally, the condition went out of gear. 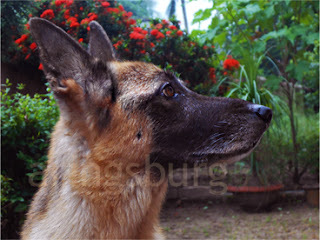 Rechie stopped lifting her head and looking at her pack members (Reva - her mom and anybody in my family) who came near her. She showed no response to touch, and gave a blank look, as if she didn't know anybody. How did I manage to bring her to the main stream of life? The depth of grief is really not possible to measure. 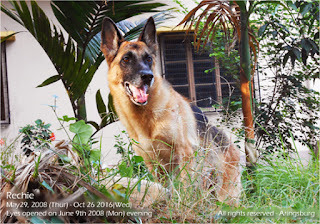 But I could understand that Rechie was severely impacted by the sudden and permanent loss of her most beloved partner, with whom she used to share her water bowl, toys, and personal times while reposing in her hall and playing in the yard. The trauma, for her, was overwhelmed by the suddenness of bereavement. No vet here was eager to focus on this problem; they were NOT eager to consider her 'grief' as the root to other problems, although they said that she was in deep psychological trauma. They were rather more keen on prescribing liver extracts, appetizers, multi-vitamins and multi-minerals etc... all of which failed one after the other! I had left with no other option but to fight that war alone! My first step was to combat grief! I had no other options opened, but to opt for homeopathic treatment. I am NOT a vet though... I admit that I have scarcely sufficient or almost no knowledge of veterinary science. Ignatia amara was a life saving medicine for Rechie. Ignatia was given as a grief remedy mainly, but this medicine also has a remedial effect on headaches, nervousness, insomnia , heart palpitations, gas, indigestion and weakness, all of which were my concerns. I administered 5 globules of Ignatia, three times a day. On the 4th day, I could notice a slight betterment in her behavior. Rechie started looking at us, when called. On the 5th day she wanted to get us, although she needed help to rise, as she was too week to stand by her own. On the 6th day she had a biscuit... not a full one though. Fortunately Ignatia amara seemed to have helped Rechie successfully fight the trauma. I continued Ignatia 200 for several days and the condition went on improving. But there were other problems, making the situations more complicated. Extremely long periods of grieving aren’t often seen in dogs. But recovery may not be always too fast. It took almost over half a month for Rechie to come out of such a life threatening trauma. In such a situation an anguished pet needs additional attention, extra love and understanding to help him/ her cope. Rechie gradually seemed to be recovering. Although apparently she was almost out of the trauma, but with more close observation I could still find a grieving heart. However, the depth of grief wasn't as much as the initial days. Ignatia could not be the only remedial process... she was given lavish love and company. This was immensely important as an integral part of the therapy & fortunately it turned out to be quite effective. The motive was to put light physical and psychological exercise. I started out with one of her favorite toys. So what is that game and why I call it a thoughtful play? Simple... I wanted her to do some task through this play, and while doing so she was required to use her brain and thoughts. Her favorite toy (not just anything she liked) was chosen because she would do work to get it. The game is too simple... It's playing fetch. But this time I consciously threw it behind things like pile of leaves, branches of trees etc. so that she was required find it from the hidings, grab it and fetch it to me. An easy and simple thought stimulating game was really effective. I made sure that she did not over exercise, as she was almost without food for several days. Initially 5 minutes exercise for her was more than enough. It was really unimaginable that a sudden traumatic shock that the loss of a beloved pack member could bring to a dog. I faced a serious challenge saving Rechie and bringing her back to the main stream of life. It all required me to think from a dog's perspective, a make some constant and close observations to her behavior, even after she was apparently recovered. Vomiting: Initially she had stopped eating completely and could not bear the sight and smell of food. When she started nibbling food, she could not eat more than just one-fourth a biscuit. And as soon as she ate she would puke out immediately. She was dehydrating fast, although she had intense thirst. She used to drink huge and puked instantly. A Homeopathic approach was again found to be too helpful. Arsenicum Album 30, worked like magic! Being one of the most effective liver cleanser, Arsenic Alb. helped a lot not only by stopping vomiting, but also by controlling the water consumption and supporting the liver function. By administering 3 times a day I got brilliant results. Arsenicum Album works effectively to combat vomiting, restless anxiousness, indigestion, heartburn, swallowing difficulties, nausea and intense thirst. For animals it works great against skin eruptions, itchy, dry and flaky. For canines Arsenic Album is very effective in specific complicated conditions like toxicity due to drug, toxicity from vaccination, food poisoning. Arsenic Alb. is also very effective against toxins in kidney or liver. Please Note: Arsenic Album 30 in a dose of thrice a day may also be effective in puppies with Parvo. Now that the vomiting was effectively checked, she had to be fed somehow, while she still could not bear the sight and smell of food. Fortunately, she did not refuse biscuits, and I took this chance; I gave her 7-8 biscuits and she slowly ate up all. I tried two more and she ate them too... drank some water. I could notice her drinking tendency quite normal. So that was her dinner for the night. I continued with Arsenic Album 30. The next morning she tried to get up but she fell. She was helped to walk out to urinate. She still continued refusing her food in the next morning (served with chicken meat and liver without bones). She fortunately ate a few biscuits again - a few more than the previous night! Gentiana lutea L and Hydrastis Canadensis (both Mother tincture): Both these medicines have proved to be highly effective against GI complaints, including lack of appetite, poor digestion and vomiting. To be specific Gentiana L and Hydrastis-Can work in slightly different indications. While Gentiana L acts as a tonic to increase appetite in patients with anorexia and treats gastrointestinal dysfunctions, nausea, abdominal discomfort, Hydrastis Canadensis, on the other hand has an immensely marked action on liver. It also works against poor digestion, feeble muscular power and obstinate constipation. Hydrastis also works against cancer and cancerous state. NOTE: Why Hydrastis? Rechie, along with all this problems suddenly start showing symptoms of Pyometra (Uterine Infection) characterized by whitish vaginal discharge, accompanied with increased amount of water intake. I guess this was also a result of the psychological imbalance that Rechie was suffering from. Yes she's a middle aged girl and the chance of occurrence of Pyometra was too common for her at that age. But the severity of the trauma, in her case, resulted a hormonal abnormality, which again is a common cause of uterine discharge that eventually leads of cancer. I took an additional support of Pulsatilla... Read Out How I Took Rechie Out of This Danger of Pyometra Too. Hydrastis Canadensis effectively mitigates of the chance of developing cancer and lessening its danger. Therefore for me Hydrastis Canadensis worked as a miracle drug, with favorable effects for several conditions - hepatic dysfunction, digestive dysfunction, poor musculations and chances of uterine cancer. I continued Hydrastis for four months thrice daily before meals and gradually decreasing the frequency to twice daily before meals. I continued administering 10 drops each time. At the end of third month I noticed the gastrointestinal problems that accompanied weight loss was much in control. However I was continuing Arsenic Album simultaneously. Arsenic Album 30 Followed by Arsenic Album 200: Arsenicum being a common and effective remedy for both acute and chronic problems is indicated for stomach problems including sever indigestion, heartburn with burning, difficulty swallowing with nausea & intense thirst accompanied with vomiting and diarrhea. Rechie's specific problems - (failing to bear the sight or smell of food, feeling of great thirst; drinking much, retching and vomiting after eating or drinking, anxiety in pit of stomach, nausea and dizziness, accompanied with small, offensive, dark stool) were all taken care of by Arsenic Alb. The feeling of great exhaustion after the slightest exertion was also noticed to be mitigated gradually. Arsenicum album has proved to be effective for patients who are suffering from a sort of fear and nervousness owing to some kind of traumatic experience of the patient or may be owing to certain situations that have transformed the nature the patient into more than usually sensitive. Reichie's situation was much similar, owing to the sudden expiration of her closest pack mate - her dad, Rex. Dosage that I followed for Arsenic Alb: Initially I started with Arsenic Alb 30, administering thrice daily prior to meals. I continued this dose for on month, followed by administering the same potency twice daily prior to meals for the next month. Then I changed the potency and frequency from 30 twice daily before meals to Arsenic Alb 200, administering thrice a week before meal. Then I reduced it to administering potency 200 twice a week. Note of caution: It can be used in different potencies - 6x, 30, 200. Arsenic Alb should be avoided for pregnant and lactating females. The dose of 6 to 200c may be safe if taken in intermittent (non-daily) by adult. Strictly avoid this remedy in puppies. Other indications: Arsenic Alb is also indicated for itching, burning, swelling, skin eruptions. Dry and scaly skin problems can also be treated. By the 4th months Rechie started showing good improvement and the time required for her to digest the food was not as prolonged as it was. I think I should have started off with my homeopathic formula instead of constantly dropping by the local vets who did not have time to spare to think deep to treat the problems at their root. However, I would still not encourage my readers to avoid going to vets and try treating their dogs at home. I had no other option but to take things all in my own hands. Even for treating the symptoms of pyometra, one of the vets suggested surgery to be the only single remedy. The second vet stated that dogs usually end up with uterine cancer if not treated surgically. Rechie's health condition was too feeble to survive the surgery. Again therefore I was left with no other option opened to take things in my hand. 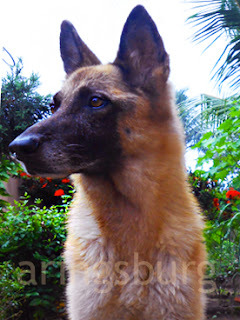 Read Out How I Took Rechie Out of This Danger of Pyometra Too. Here are some current pics (shot today - Monday, august 17, 2015) of Rehie. She is still little skinny, but recovering fast. Lord bless her!